When we last left our exploration of Gothenticity, we were speaking of the Victorians and their musings over dark, albeit ladylike duds. 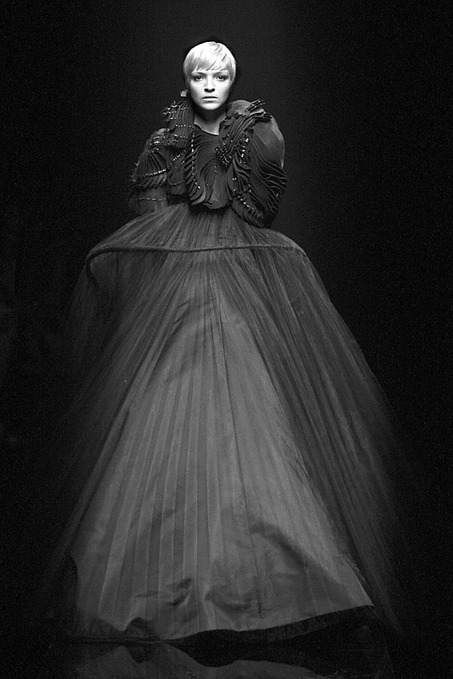 That Victorian influence is still evident today in dresses like the one by Olivier Theyskens in the last post or this one by goth guy, Lee McQueen. The sweeping gown is still there but paired with leather sky-high boots. The jet jewels remain but the influence is Indian – which is particularly clever of McQueen to make reference to. You see, the British Raj of India had begun in 1858, so there was travel and trade going on between the countries at the time. 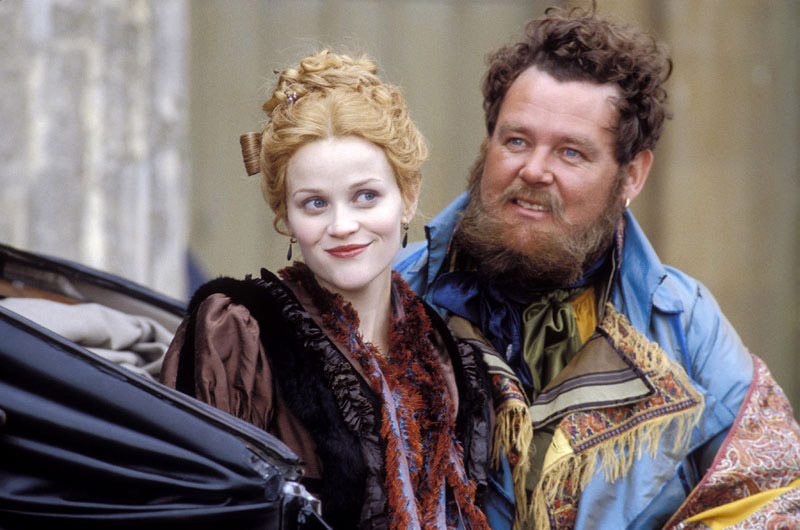 Mira Nair makes many visual mentions of this in Vanity Fair, starring Reese Witherspoon (who incidentally, has worn lots of stuff by Olivier and McQueen – in fashion’s six degrees of separation). Passion and practicality amongst the pashminas in Mira Nair’s take on Vanity Fair. That was the latter half of the 19th Century. Goth glamour saw a major revival in the very late 1970s and early ’80s – again, in the birthplace of cool – England. Bands like Siouxsie and the Banshees, The Cure (whose lead singer was also a member of the Banshees in the early days), The Damned, the Sisters of Mercy and Bauhaus embraced this love of all things dark. They wore black (not new by any means) and had crazy hair, taking points (no pun intended) from the King’s Road punk kids that preceded them by a year or two. Dear prudence, won’t you come out to play? 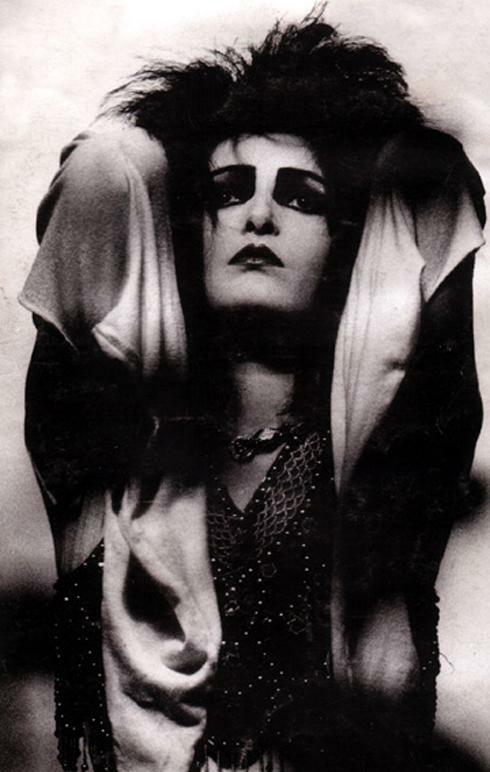 Siouxsie Sioux in all of her gothentic glory. Siouxsie Sioux is still one of the strongest, most original women in music as far as I’m concerned. She epitomized glam as we knew it then – well before I was versed in the couture or courtly definitions of it. Her make-up was flawless and we all wanted that hair, that presence. It’s because of women like her that today’s pop tarts can even imagine a musical and pop-cultural career. Siouxsie Sioux is gothentic – she was then and is now. Authentic isn’t a word you use very often these days when referring to music or fashion. And the man who started a musical revolution without even knowing it (not to mention the countless boys and girls walking around with smudged red lipstick) is Robert Smith. His look was usually simple back then: all black, big hair, pointy shoes, black eyeliner with a few variations here and there. 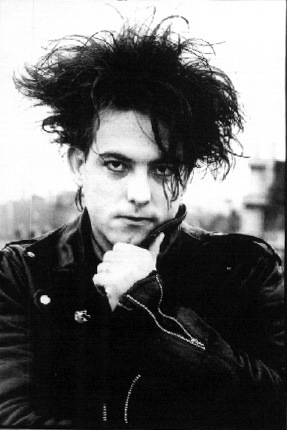 Robert Smith: Dressing up to be all this. I remember being in a car as we pulled into the parking lot for a Cure concert I attended. The line-up had one running silhouette: trench coat, skinny pants, pointy, exaggerated shoes and big, big, spiky hair. The colour story of that line was all black, of course. That was the power of Smith’s fashion influence. When he switched to a white shirt, we gasped and shuddered, but wore one ourselves nonetheless. When that white shirt became a polo shirt and the hair got cut, we almost defected, our eyeliner running from the tears… But then, Robert went back to being Robert and we breathed a sigh of relief. With all of the 1980s influences in fashion of late, it wasn’t a surprise when leather, black and a motorcycle jacket appeared on Evan Biddell’s runway. I loved its pairing with a flowy skirt – it made for a striking contrast. 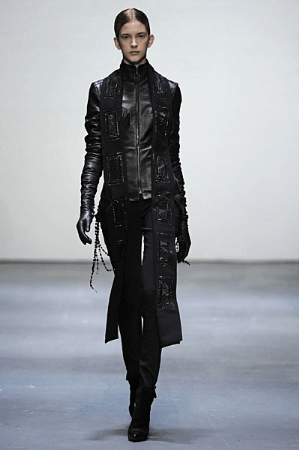 Evan Biddell’s FW09 runway. Photo by Angela Y. Martin. Evan B’s modern goth rock chick for SS10. Photo by Angela Y. Martin. Biddell isn’t the only one with an obvious love of the dark. Gareth Pugh is all over it and I particularly love Todd Lynn’s lanky ladies lurking down the runway. Lynn’s tall, dark and then-some look for FW09. Je want. I remember stumbling into another great Canadian designer’s store for the first time in 1984…Pam Chorley’s Fashion Crimes boutique. It was a magical wonderland, chock full of feathers and other finery. Wherever you looked, it was a visual smorgasbord. And when I say chock full – I mean packed to the ceiling and every nook covered in a thousand accessories. The boutique moved across the street, to a much larger (and brighter!) location and is still an integral part of Queen West today. I’m still glad I have the original in my fashion memory. I won’t give away my silk, American penny button blouse bought there ages ago, out of sheer nostalgia. I also have great new pieces bought on a recent summertime stroll. Accessories by Fashion Crimes, Toronto. 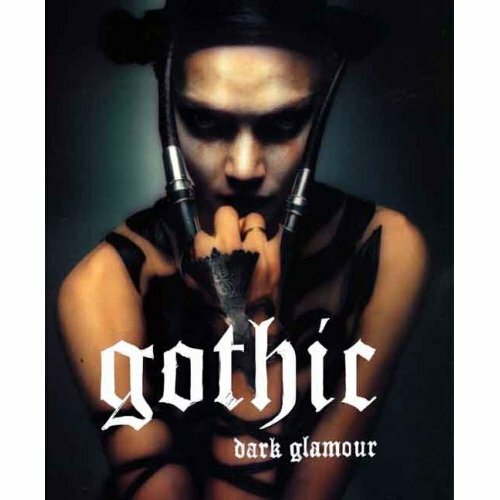 So, imagine my delight when I attended the Gothic: Dark Glamour exhibition at FIT in NYC a couple of years ago. Valerie Steele did the period such divine justice with the exhibit and in her excellent book by the same name. Now there’s a conversation I’d love to get lost in – a dinner with Ms. Steele on the topic of gothic fashion. 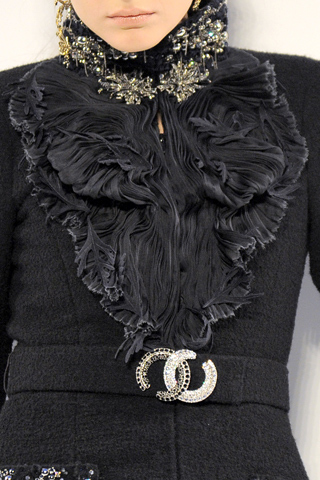 I’ll add it to my list of couture dreams, I suppose. The cover of Valerie Steele’s excellent tome on the topic. 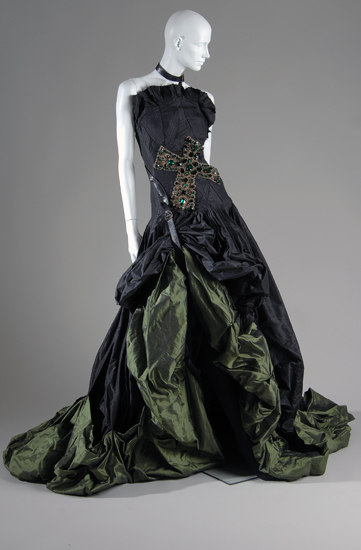 One of the dresses from the exhibition: Ricardo Tisci’s goth gown for Givenchy Haute Couture, FW06. 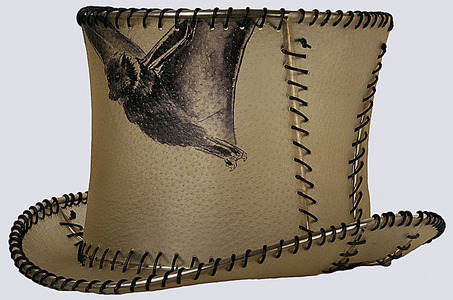 J Smith Esquire top hat, as seen in the exhibition, Gothic: Dark Glamour. In the next part of the series, we’ll discuss goth goddesses du jour. Image sources: Black Eyed Suzie; McQueen FW08, Todd Lynn, Chanel, Ann D, Givenchy Couture looks from Style.com; Vanity Fair film still; Siouxsie; Robert; Evan Biddell runway photos courtesy of Angela Martin Photography; Gothic: Dark Glam cover and fashion photos courtesy of Museum at FIT; Fashion Crimes blog. Previous Post Resolution or Revolution?